I started updating the Yipe! Software website. Got a few of the new pages up. (You are on the new version). As you can see though, there is still more work to be done. This page is a bit messed up right now, as is the comments page. I submitted the next update to Apple for Yipe 5 (app store yipe link). Here’s the overview of changes as well as a bit extra for Yipe News page readers! New Dungeon! Can you find the treasure at the end? Or does it end? User can now move the controls (d-pad) to the left side of screen. A few new secrets added around the world. New Progress Bar to see progress towards exp needed to advance to next level. New heal item you can find, Mushroom Spores, from… well… Wild Mushrooms, of course. New Quest from Puff’s hut. New option for controls so you can see basic player stats displayed in controls area. A number of new/different messages around the world and from the King’s Castle. All moving monsters now have an alternate image to show movement. 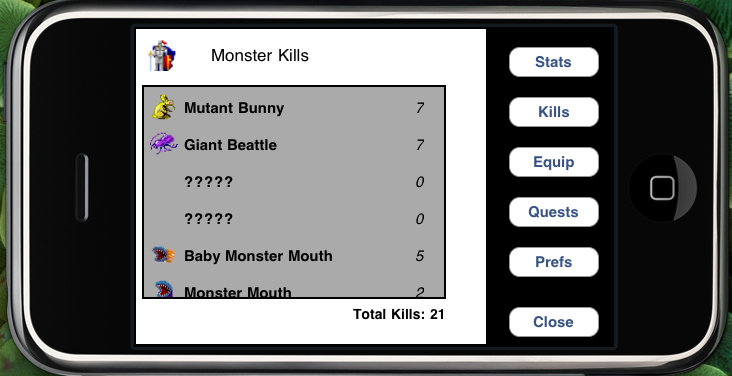 All monster and player images should show up clearer in combat screen now. We use monster name in combat in some places now instead of generic terms. Added an extra screen in final credits, along with some info on secrets you missed. Cleaned up quests screen a bit. Don’t display “close” button in Puff’s hut if there is a special message from Puff. Four new sounds. Find cool item, minor injury, water hole drinking, boulder moving. Yipe News page extra: New elf character icon that you can find in new player creation. Lowered the cost of a few of the heal items in the heal shops around the world. Some final monsters now will drop a weapon or armor item when you kill them. Magic Shield healing slightly reduced. Special abilities don’t work quite as well versus final monsters, especially Idle Hands. Player level plays a slightly lower factor on special skills after level 15. Higher level monsters will not appear on surface until you discover them. Fixed a bug with character creation if you used “back” button. Attributes would end up incorrect. Fixed bug with backpack quest becoming uncompleted. This is repaired in Puff’s hut if it happened to your character. Fixed display issue in combat text if you tried to select the text. Link to Idle Hands Toy page fixed. Fixed spot in fire cave where you could end up on top of lava. Footsteps play properly on sandy roads now. Settings/Preferences now save to device from within app. On Saturday late afternoon, December 5th, I got a text from my friend Jeff letting me know that Yipe 5 was live, in the app store! Great weekend of working on iYipe! Hoping to finish up a few last things tonight and then submitting to the app store! Oh, and we’re up to 47 facebook fans of Yipe! As a special news page sneak peak, I have to say this is one of my new favorite monsters. 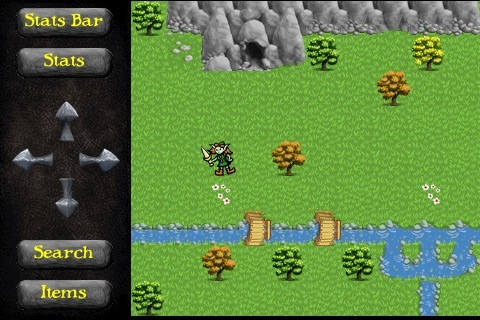 Ok, I can’t resist showing you an image with some of the new graphics. Not quite finalized, but this is a good sneak peak. Another good weekend for development. Most exciting part this weekend was putting in the sounds that Andrew (sound/music guy) sent me. Some pretty sweet monster death sounds and the background music for entering a cave, very cool! Lots of new monster graphics from Dylan (graphics guy) are sitting in the works waiting for me to plug them in as well! Targeting end of October for release. Ahh, trying to find free time. Always such a challenge. Here and there I have been plugging away at iYipe though. Today I feel pretty excited about the game. Combat, heal items, some of the storyline and other random things are mostly complete. The big picture items still remaining are: New character creation and intro. Filling in the last couple caves with their appropriate monsters, chests and quest storylines. Sounds. End game sequence and high scores. Hmm, probably a couple other things I’m forgetting at the moment as well. Big things in the works for iYipe! 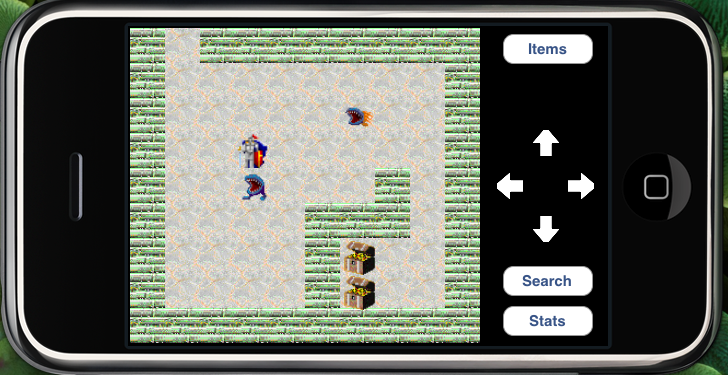 Over this past weekend, I made a lot of progress on the framework of the iphone game. Combat is in place and I’ve been working on the balance of the game, making sure the difficulty/ease of play is where it should be. 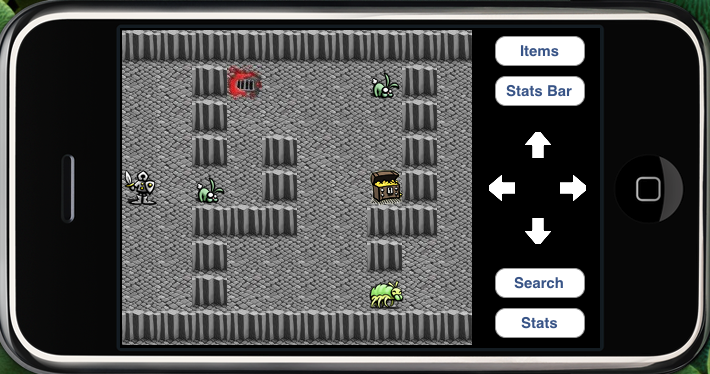 Roaming monsters are there, as well as in game messaging to the player. However, the big news is… well, I can’t share that just yet. But I have to say I am beyond excited about the possibilities iYipe is going to have in regards to storyline and cast of characters. Big things are in the works, stay tuned!